The guide has been produced, providing information for employees on their rights and entitlements as well as what to do if these are breached. 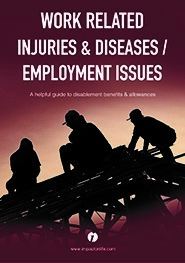 The guide also provides information for people suffering from an injury or illness which has taken place at work or as a result of the working environment. Legal and general advice on liabilities, employment rights, claiming etc. is all covered in this guide, along side step by step information which is provided to help the reader in every way. The full range of Healthcare Media publication titles are available free of charge for distribution to the public. The literature is currently in demand by doctor’s surgeries, citizens advice centres and hospitals. The publications are financed through the inclusion of relevant local advertising beneficial to the reader.